This curious, spherical, multi-capsule mic aims to take all the hassle out of capturing multi-instrument recordings. Does it work? While multi-mic recording offers lots of flexibility, it requires a lot of expertise, and even then you can fall foul of phase problems. 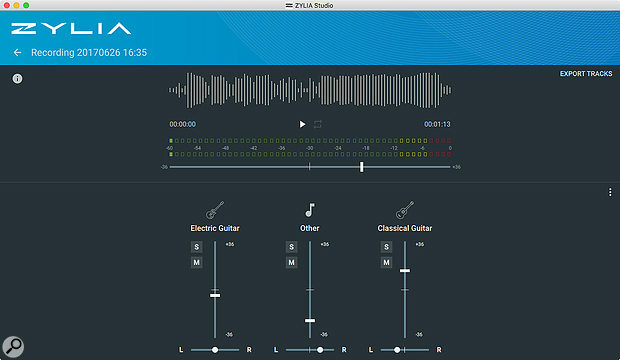 Zylia offer a much simpler approach for recording multiple musicians: everyone sets up around a single microphone array and then software takes care of the rest. If that sounds appealing then read on. 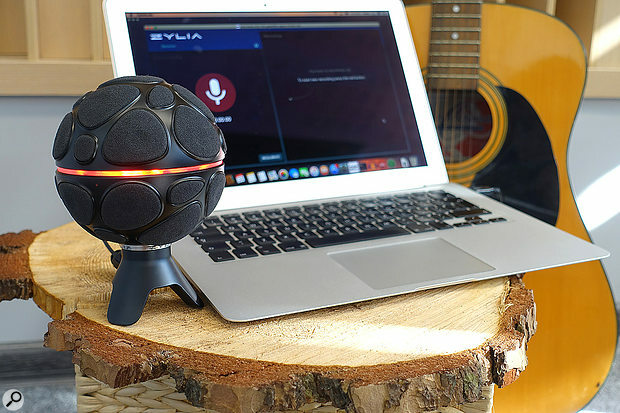 Zylia’s spherical microphone array, along with its associated software, permits 360-degree recording. Nothing new in that, you may say, as Soundfield have been doing that for a long time using just four capsules, but Zylia’s novel feature is its ability to automatically optimise its pickup patterns and directionality to suit the instruments being recorded, via a simple auto-learning process. Essentially it behaves like a number of discrete ‘virtual microphones’ working at the same time, the number depending on how many sound sources you need to record. The mic and its support software do most of the hard work for you, as there’s a very simple setup procedure, and the upper limit to the number of sound sources is far higher than anything you are likely to need. The resulting separate ‘recordings’ made from each ‘virtual microphone’ are mixed to stereo but may be rebalanced using the simple ‘levels and pans’ mixer that comes as part of the Zylia Studio software package. Alternatively, the recording may be split into separate tracks, which you can then import into your DAW to continue working on them. It is also possible to decode the audio in surround. Currently this splitting is a post-recording process but I’m told that there are plans to develop a plug-in that can decode the separate audio streams for recording in real time. However, you can route the 19 onboard capsules, all of which have an omni response, to discrete DAW channels should you wish, as once the driver is loaded the mic shows up on your computer as a 19-input audio interface. The technical details on how these omni mics can be used to create very directional virtual mics are not covered in the manual, but from Zylia’s description of the technique as ‘beam forming’ suggests that the processing may involve delays in much the same way as a beam-steering speaker array, but in reverse. There’s also little of any other kind of technical information, such as noise performance or frequency response, so all judgements in this case were subjective. The package comprises the Zylia ZM-1 spherical 19-element mic array, stand-mounting hardware with a thread adaptor, a USB cable and instructions for downloading the software for Mac OS, Linux and Windows platforms. Drivers are also downloaded from the Zylia web site. Recordings are made in WAV format at up to 48kHz, 24-bit resolution. A quick-start guide is included, and a full manual is available online, but using the system turned out to be almost childishly simple. Once you plug the mic into a USB port, it is powered up and an LED ring around its centre lights up blue. This turns red when recording or green if in test mode. If you find the light distracting it can be dimmed or extinguished. Around 100mm in diameter, the spherical shell is made from metal and finished in what looks like a black powder coating. The larger of the grilles covering its surface protect the 19 capsules, nine on the bottom half and 10 on the top. From what I can tell, the smaller grilles are purely cosmetic. At the base of the sphere is a cast-metal, three-legged desk stand with a recess cut between two of the legs to allow access to the USB port at the bottom of the sphere. A thread adaptor is fitted centrally below the sphere to allow conventional stand-mounting, which is the preferred way to use the microphone. The optimum height for operation is to have the sphere around the same height above the ground as the instruments being recorded. The Zylia Studio software decodes the 19 capsule outputs into a multi-channel recording, which can either be balanced and panned within the software itself, or exported for further processing in your DAW. Once you tell the software that you want to start a new session, it guides you through the calibration procedure, in which each of the performers, ideally set up around the mic at roughly equal angles, is asked in turn to record eight seconds of audio. At this stage you can also pick the type of sound source from a graphical menu, whereupon the appropriate icon shows up in the software mixer. The software then works out the direction of the sound sources, the polar pattern required for each, and if you have selected an instrument type during calibration, it also adds further instrument-specific processing to maximise separation. Many common instruments are listed along with an ‘Other’ option. There’s no gain setting so if the recording level is too high you just have to move the sound source further from the mix. When the calibration is complete you get to see a graphic of the mic along with the placement of the sources. Once the process has been repeated for all the sound sources, you can start your recording. 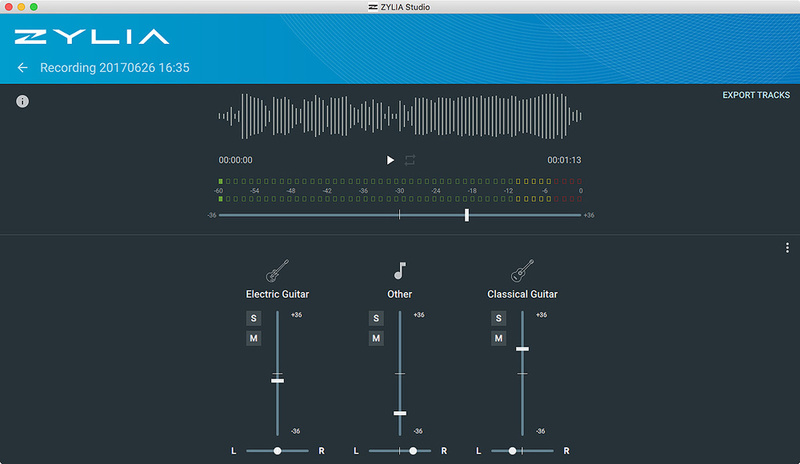 The Zylia Studio software provides instant gratification in the form of a stereo mix and you can use the onboard mixer to change the level and pan placement of each part. This is accessed by a mixer icon at the end of the stereo waveform view. Obviously separation isn’t perfect — as it wouldn’t be if using separate discrete microphones — but it is usually quite adequate to help achieve a good balance. Should you want to move the separate audio streams into a DAW, there’s a Separate button at the end of the waveform display of your recording. This process can take some time, especially if you have a lot of sound sources, but once unravelled, these separate files can be dropped into your DAW for further treatment using the Export button. Because of the time taken to separate files, it is better to record single songs rather than leave the recorder running for the whole rehearsal or gig. And that really is all there is to it. The manual is delightfully brief, the software walks you through each step without you even having to look at a manual and the recorded results are quite natural sounding. I didn’t notice any significant background noise and the mic coped equally well with electric guitar, acoustic guitar and percussion. So what are the limitations? Clearly, not having control over gain means that louder sources have to be moved further back from the mic and in some cases that might allow more room ambience to encroach than would be the case if you’d been allowed to choose the optimum miking position. The same goes for instruments like acoustic guitar where, with conventional miking techniques, you’d move the mic to the sweet spot for the instrument. As you’d imagine, separation is best with relatively few sound sources but you can achieve a decent mix from four or five people set up around the mic as long as they don’t move too much from their original positions. The result in this respect is at least as good as pointing a handful of cardioid mics in different directions. What you get from the mic is a pretty natural-sounding recording of musicians playing in a space, which could be perfect for some musical styles — such as folk, rootsy blues, some types of jazz, string quartets and so on — plus you have the ability to balance the sound sources after recording. Maybe this approach is less well-suited to some other musical styles (hip-hop or thrash metal may not make good partners? ), so whether a Zylia system is for you depends very much on the kind of result you are aiming for and also on the type of music you wish to record. What the system has going for it, other than ease of use, is that you can record everything using a single device, and that the capsules are so close together that the phase problems associated with conventional multi-miking approaches are largely avoided. You also don’t have to worry about tripping over mic stands as only one is needed. Just as we were going to press, Zylia told us that they plan to release a more affordable ‘musician’s’ version of the package, while it also seems that the company have plans to expand the abilities of the mic and software into surround applications (see box), so it’s worth keeping an eye open for further updates. A Soundfield mic or one of its clones can be recorded in B-format and then decoded to behave as any number of virtual microphones. “The ZM-1 uses 19 omni-directional microphones spread equally over the sphere. Outputs from all 19 microphones are used to form a virtual microphone of any spatial characteristic. We call this technique ‘beam forming’. This approach is extended by using a sound separation algorithm in order to increase the sound separation and reduce spill between each virtual microphone. Some of the facilities that would help this microphone better integrate into a traditional studio setup, such as real-time, multi-channel decoding, have not yet been added. Mixing facilities are very basic. Splitting recordings into multiple channels is time consuming. The Zylia mic system is easy to use and capable of impressive results, though in its current incarnation the lack of real-time channel splitting means you can’t just treat it as a multi-channel recording interface other than for recording the individual mic capsules to individual tracks. $1228.70 including shipping & VAT.